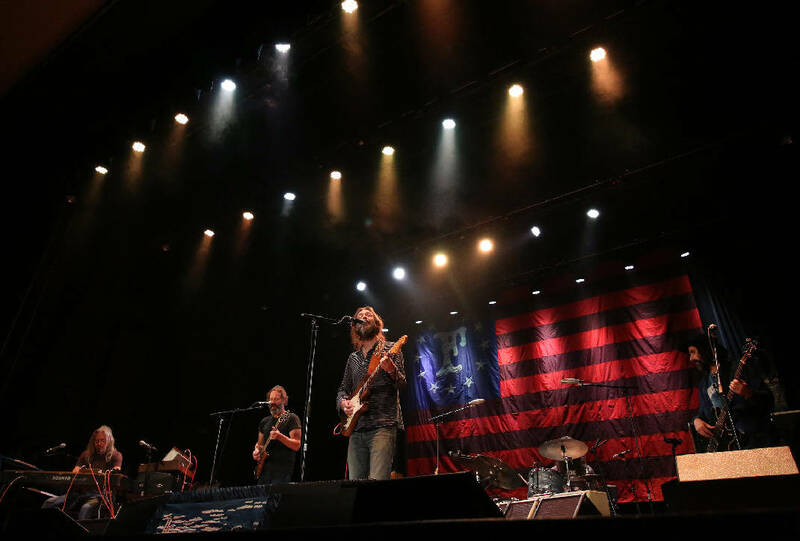 The Chris Robinson Brotherhood performs Thursday, October 18, 2018 at Walker Theatre in Chattanooga, Tennessee. The Tivoli Foundation has put $325,000 into new sound and lighting equipment as well as other improvements into the lobby areas of the Walker Theatre. When Mayor Andy Berke announced in 2015 that the city of Chattanooga was getting out of the venue operations business and turning over the running of the Tivoli Theatre and Memorial Auditorium to the Tivoli Foundation, it was not lost on some that the organization's name only made mention of one of the two venues. Even less was said about the Robert Kirk Walker Community Theatre. The city's Department of Education, Arts & Culture, as it was known then, had overseen renovation of the 800-seat theater for two years prior, but many people in Chattanooga had no idea the place even existed. But, one year after the Tivoli Foundation pumped $325,000 into installing new sound and lighting equipment and other improvements into the lobby areas, the Walker has seen in 258-percent increase in the number of shows — from eight in 2017 to 32 in fiscal year 2018 — helping the auditorium turn a profit for the first time in years. In fact, the three venues combined were costing the city about $1.5 million a year before the formation of the foundation. And while the auditorium by itself is not operating in the black, the two venues combined did turn a profit for the first time in many years, Tivoli Foundation Executive Director Nick Wilkinson said. "Because of the Walker, for the first time this building is making money, and that money — like everything else we make from ticket sales to concessions to donations — goes right back into the facilities," he added. "The Walker is really emblematic and represents everything that we are trying to do — and it has happened in one year." Fan Terryl Greene has attended a half a dozen shows in the Walker Theatre in the last year. "I think it's wonderful place to see a show," he said. "It's so intimate and great that it brings the medium-sized acts. I've had some great memories there." Performers like playing the room, as well. "It's a beautiful theater, and we loved being there," says Karen Mills, a locally based comedian who performed at the Walker in September as part of the "Country Cool" tour with Leanne Morgan and Trish Suhr. "Everything about it was wonderful. The whole thing was just a class act, from going through security to the green room to the stage. It's a very intimate room, even though it seats over 800, which is great for a comedy show." While the future for the Walker Theatre looks bright, its fate was not so certain just a few years ago. In 2015, some community members worried about what to do with the aging Memorial Auditorium. Opened in 1924 and once the city's civic center, playing host to everything from professional wrestling and car shows to graduations, it had become almost a liability, costing the city more in repairs and upkeep than it could bring in with rentals, concerts and shows. In the past decade, fewer and fewer concert tours were looking to book a show in a 3,700-seat venue in a town known for last-minute, walk-up crowds — if they came at all. The Tivoli, at about 1,700 seats, was an easier sell, but it also needed — and still needs — a great deal of expensive TLC. Renovations and upkeep include repairs to roofs, heating and air conditioning, carpeting, bathrooms, paint, electrical, plumbing, etc. — in both buildings — which adds up. "We could make a profit every year for 150 years and not make a dime," Keith Sanford, chairman of the Tivoli Foundation board, said in 2017. Which is where the Tivoli Foundation comes in, Wilkinson said. Created in 2015 by Berke to oversee the city-owned facilities, the foundation is responsible for the sustainability of the buildings. Though the city no longer manages the venues, it promised to provide $1 million in capital each year for five years, until the foundation is self sustaining. As part of the financial commitment, $750,000 was earmarked for operating expenses and the rest as capital for producing events for the first two years. In 2016, it contracted with AC Entertainment of Knoxville to manage and book shows in the facilities. AC gets a flat fee for programming and operating the facilities. Profits from ticket and concessions sales, as well as donations, go to the foundation, which puts them back into the buildings. AC has a similar contract with the Tennessee and Bijou theaters in Knoxville and the Orange Peel in Asheville, North Carolina. Ashley Capps, founder and CEO of AC Entertainment, said it took about 20 years for Asheville to build a thriving, sustainable music scene, and that Chattanooga is "way ahead of that." "We are very, very bullish on Chattanooga," he said. Ted Heinig, vice president of concerts with AC, said having the three venues gives them an opportunity to develop relationships with artists as their careers grow. Coupled with the other different sized venues in town and the relationships it has with management at places including Songbirds, with its roughly 200-seat upstairs room and 650-seat downstairs room, and the newer The Signal, with a 1,500-person capacity, the city has plenty to offer. "We are starting to connect with some of the acts earlier," Heinig said. "Before, the first option for us was the Tivoli with 1,700 seats. Now, with the Walker, we can get the up-and-coming artists into the Walker and then, as they grow, the Tivoli and then Memorial. "Chattanooga in the last year has completely changed," he added. Heinig and Capps also pointed to the Moon River Festival, which they co-produced with founder Drew Holcomb in September at Coolidge Park. The 10,000 tickets for that festival, which moved from Memphis to Chattanooga this year, sold out in eight hours, with 6,100 of those tickets going to out-of-town buyers. "Moon River is an important component also," Capps said, "because it brought agents and managers and other people to Chattanooga who had never been here. They all said, 'Wow, what a great town.'" Contact Barry Courter at bcourter@timesfreepress.com at 423-757-6354.